Hiking Waterfalls in New England, by Eli Burakian, 2015. 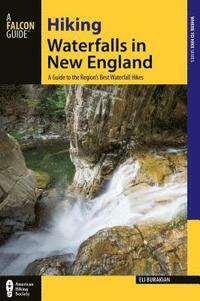 This guide by an avid hiker and professional photographer leads you to 101 of the most scenic waterfalls across the six-state New England region. The waterfall trips range from easy roadside strolls to remote wilderness treks, and feature detailed directions and descriptions plus color photos and maps.336 pp., 6" x 9."